In my last post, I closed with the suggestion that the Conflict Resolution Guide (Conflict-Guide) from the Plum Village Lineage North American Dharma Teachers Sangha was a Straw Man whose intention (wittingly or unwittingly) may serve to scare away those who need the resources of the sangha rather than provide very necessary resources. This is the koan that all of us in our communities must confront, absorb, and feel its heaviness in our bellies if we are to create environments of practice that are truly in the service of ending the suffering of all beings. Pragmatically, how do we set up a safe zone in which complaints of all forms can be addressed with discernment and compassion while ensuring that the process itself is not a re-traumatization or a discouraging bureaucratic mangle that distorts truth and prevents transparency? The first post of this series was generously shared among several zen teachers and practitioners’ social media. Among the many comments was one that offered a kind consideration that this guide may be simply for low level conflicts and not the more serious ones such as sexual, emotional, and/or physical abuse. There is no argument against that however one would wonder why the North American Dharma Teachers Sangha of the Plum Village Lineage would not have been precise about the purpose of the document. So let’s start with the document’s introduction which I approached (in real life and as a thought experiment) as someone seeking resources and recourse in the event of an incident of abuse. Nothing in the background explanation or subsequent paragraphs define the purpose of the document other than its aspiration in the vague occurrences of “conflict.” While conflicts can be very useful occasions for deepening one’s practice, it is not always the best time to do so, particularly if the conflict involves potential harm or increased probability of harm. The fact that this document was provided to me as evidence of available resources and recourse for people who have experienced sexual misconduct on the part of their dharma teacher implies one of two (or many) things. First, the dharma teacher who sent it me has no clue what I was trying to point out (that the PVL sanghas have no clear path for dealing with sexual misconduct). Or, second, the PVL’s NADTS don’t know the difference between conflict and abuse. Now, I find that really hard to believe because the NADTS is comprised of people who are lawyers, teachers, former law enforcement members, chaplains, and some trained in the medical field. Nevertheless, I’ll grant a third possibility which is that this document is intend solely for interpersonal disagreements and not the more serious issues of abuse. But if that’s the case, the game of “telephone” between the NADTS and the very senior level dharma teacher who spoke to me needs a bit of noise reduction. 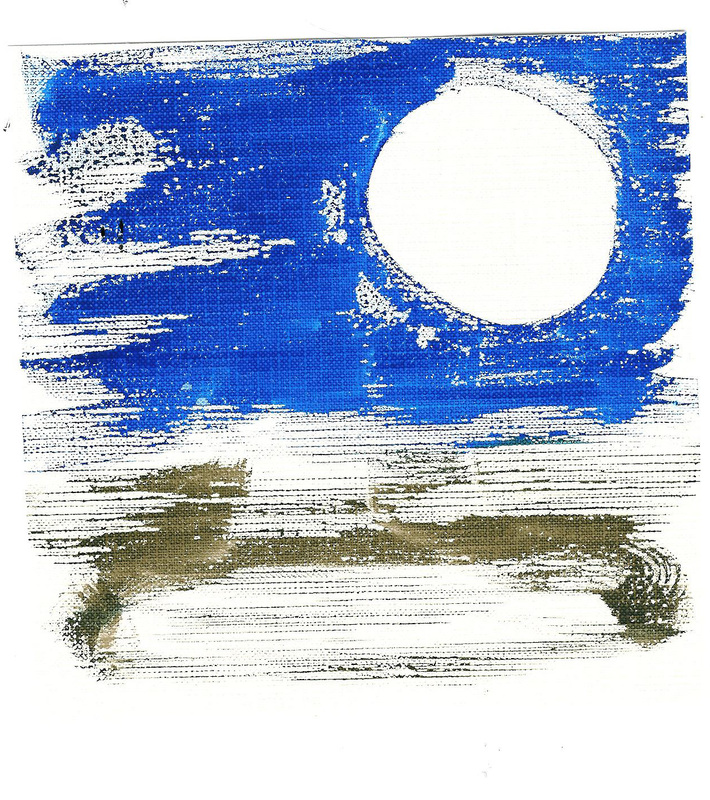 Here we have a definition of conflict from the perspective of the DTS as a “disturbance” in the atmosphere of the sangha and its intention is to “always” restore that balance (in the service of harmony) [as a sidebar – there’s a bit of conflation of balance and harmony]. At this point, as someone concerned for the person who has reported an issue of sexual misconduct, I am wondering what the term “always” will mean when placed in the service of restoring balance so as to be harmonious. In other words, what will be sacrificed to reach this absolute and non-negotiable goal. “Always” is a big word with hard edges that can blind us to our insight and separate us from our ability to be with someone’s suffering (com+passion). I’m also concerned about the naïveté in the idea of transcending “adversarial punitive approaches.” If we’re dealing with personality conflicts or arguments related to the bells, yells, and smells of practice, then it would be admirable to find an alternative measures to dispute resolution. However, in the case of abuse, there is a larger context in which this needs to be placed. Whatever we may wish the local laws to be, they are what define recourse. I, as a health care professional, am bound by law to report harm and risk of harm, not because I don’t have skills to facilitate conflict but because some levels of “conflict” are against the law and their adjudication is outside my scope of practice. Although I have misgivings about the use of victimology perspectives, I can’t disagree with the initial statement. 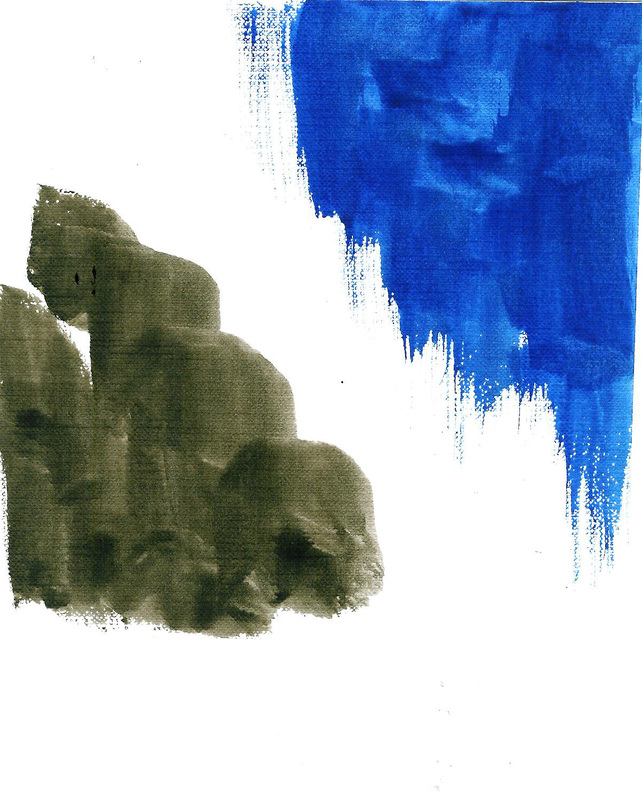 However, it then goes astray by assuming that everyone coming into the resolution process is endowed with the ability to self-reflect when they are feeling threaten or unsure of the level of support they have. To explore what we bring of ourselves into any situation is a lifetime process and best done well before sitting face-to-face with the person whom we believe has perpetrated the harm. In the case of serious harm, asking the person who feels the harm done to them to reflect on their role, their habits, and stances to difficulties is not only premature but unrealistic. In fact, it may just plain be cruel. Furthermore, despite the high, albeit uninformed, ideals, I wonder (as did other Zen teachers who wrote to me) whether the restoration of harmony should be a priority over determining truth and creating a safe environment in which to express the harm done. And now for the bait and switch. Having read and accepted (presumably one would have to so as to move forward from that “stuck” place) the aspirations of the DTS, we enter into that phase where the Straw Man tries to look threatening enough to scare away the complainants. The Second (non-attachment to views), Fifth (taking care of anger) and Eighth (true community and communication – includes the directive to stay in the sangha) Mindfulness Trainings of the Order of Interbeing AND the second of the Fifty Verses on the nature of consciousness. Pause here for a moment and consider not only the pragmatics of this directive but a bit of reality testing. First, the Mindfulness Trainings of the Order of Interbeing are a complex set of vows requiring study and ordination is equivalent to taking jukai. The typical complainant is not likely to be an OI aspirant or, feeling under threat, to have the psychological energy to wade through the somewhat convoluted and idiosyncratic wording of precepts in the middle of feeling at risk. Second, the Fifty Verses is based on the Abhidharma’s theory of mind. Not something to be taken lightly, Reb Anderson states in his Introduction to Understanding our Mind. “These teachings on mind are difficult, daunting, and complex,” he writes, explaining that he has gone over and over them in his lifetime as a Zen practitioner. Moreover, the second verse, when misperceived, can run very close to the edge of blaming the complainant for their response to the events or interactions. Another recommendation is to do a Lovingkindness meditation keeping the assumed perpetrator as the focus of metta. Again, there is nothing wrong with a metta meditation however in my experience of working with individuals who have been in difficult or traumatizing situations, this is too much to expect in the immediacy of the events. The set of the document assumes the conflict is ongoing which means metta meditation is premature and makes a huge assumption of the capacity of the individual’s practice when in distress. The recommendation of doing a Beginning Anew process is also seriously misguided. This is a risky protocol of “flower watering” or telling one’s putative perpetrator about things that are good in them, then airing one’s negative feelings about what they did, and expressing regrets for what one has done (typically conducted in sangha). 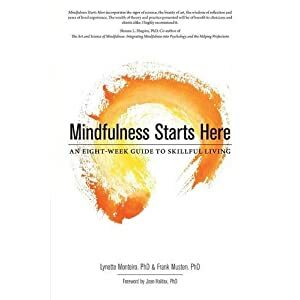 In a recent article, following the retreat at Brock University in August 2013, physician Patricia Rockman of the Centre of Mindfulness Studies writes about a Beginning Anew that goes horribly wrong in public. (This event was also described to me by someone who was at the event and the details are identical.) Rockman’s suggestion that psychologically sensitive issues should be placed in the hands of people trained to deal with them is one that has been raised in every Plum Village Lineage retreat I’ve attended. Health care professionals have also tried to raise awareness that certain issues are required to be reported by law (e.g., potential harm to children in chaotic families), only to be dismissed. What troubles me most is the impenetrability of the wall of misunderstanding and dangerous assumptions about psychological issues. Given the vast resources that educate us about the vulnerability of our mind, it can only be called a willful ignorance. But onward. Having completed all this reading and contemplation, the aggrieved person is asked to complete the Conflict Analysis Form. This form is likely the most damming aspect of the process. I advise a detailed reading of the questions which are too numerous to address here. What I do want to point out is that most people I interview following a conflictual event (this ranges from dealing with a bully at work to being blown up by an IED in a war zone) – already hyper-vigilant and physiologically activated – would feel shamed and blamed by the questions. More than that, their experiences of being emotionally and/or physically assaulted result in significant cognitive and physiological changes. Information is not processed in ways that make sense nor is recall always coherent. For a terrific explanation of what trauma does and how to deal with it, you can read Nellalou’s post on Smiling Buddha Cabaret which I frequently recommend to clients. My advice at this stage of reviewing the Conflict Guide: If you are in a conflictual situation or have experienced abuse, do not complete this Conflict Analysis Form without first showing it to someone you trust. If there is no one you trust in your circle of family or peers, take it to a professional who understands trauma, bullying, and interpersonal conflicts. This is something to work through in the presence of someone who can walk you through it carefully and ensure against your taking too much responsibility or blame. The complainant can call in other members of the sangha and, if required, other Dharma Teachers to assist. That the resolution is still held in a closed inner circle of strongly like-minded people seems not to be a concern. 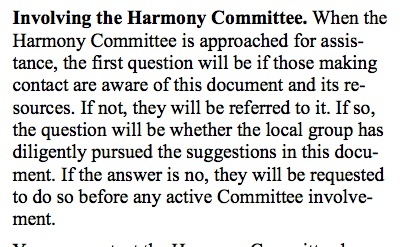 But when does the “Harmony Committee” actually get involved? In other words, they will step in when they’ve ascertained that the complainant has done everything in her/his power to resolve the conflict by following all the directives in the guide with the very person who is or people who are part of the conflict. The shorter answer is “Never” because anyone who has experienced any level of conflict or abuse will have given up by the first request to read all of Thich Nhat Hanh’s books, let alone at the idea of sitting vulnerably in sangha or alone with the person involved. Of course, that may help with the book sales which would help with creating more sanghas which would help with creating more feelings that this document actually serves a realistic purpose. But I shouldn’t be so jaded. I deal with insurance companies every day. This is the first thing I tell my patients when we embark on doing battle for treatment benefits: They job is to tire you out, to frustrate you, to make you believe that going away pays more than hanging in. That is their JOB, not their philosophy or their values or their hatred of you. In fact, YOU don’t exist. What exists for them is the drive to maintain their internal structure of self-preservation. Well, Happy Fourth Anniversary to 108 Zen Books. What a way to celebrate! First, I’d like to thank everyone who has responded to the previous post announcing the Conflict Resolution Guide from the Plum Village Lineage North American Dharma Teachers Sangha. Your comments, here and elsewhere on the social media, have been instructive, decisive, and very reassuring. Some of you have called me and offered wise words of advice and support. I thank you, one and all! Second, this is a difficult issue, one which can devolve quickly into mud-slinging and histrionic allegations. And let’s not lose sight of what for me is a painful reality that we are addressing a community lead by Thich Nhat Hanh, one of the most beloved Buddhist teachers in the Western World. I freely admit my blindness in this regard. 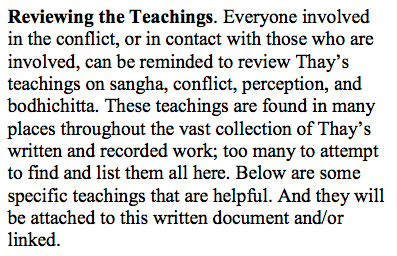 Thấy is my root teacher and I continue to hold a defensiveness about his responsibility and accountability in this. In my own rationalizing process, the teacher is at a far distance from the industry that is the global sangha he has fostered. While the Industry of the Plum Village Lineage has demonstrated a resistance to learning appropriate processes and protocols from the world around them, I continue to believe that Thich Nhat Hanh is willing to live what he teaches. In a telling example, I watched as Thấy tried once to bring an offending Dharma Teacher into line. However, without the support of the larger community, Thấy’s directives that this teacher suspend his teachings for a year and work under the supervision of other teachers were ignored and the Dharma Teacher continued to be supported by peers and communities. In my view, the machinery that is the Plum Village Four Fold Community appeared to have slipped the ethical moorings of its teacher and to be navigating without its North Star. Third, to my own knowledge, I can speak to only one victim of sexual harassment. While this is a necessary piece of information through which to examine the existence and viability of due process in reporting issues of sexual, emotional, and physical misconduct, it is not sufficient. Without someone stepping forward and being willing to speak to her/his experience, there is nothing to investigate, report, or engage in; and to do so as an ad hoc speculative process would be irresponsible. To be charitable, I can see the Dharma Teachers in the PVL trying to meet the escalating need for guidelines to deal with the many and varied sensitive issues with which they are faced – yet falling far short of what is immediately necessary. As I once wrote on the Order of Interbeing forum, there is no need to use terms like “if” sexual abuse occurs, it is a safe bet that it already has. The real issue is whether we as a community are prepared to meet these incidents with an unrelenting commitment to transparency and the truth-seeking mind. Of course, there is so much embedded in the philosophy of the PVL that is idiosyncratic in its interpretation of the Dharma. The adherence to “harmony” and “balance” is one. Another is the persistent use of the phrase “Are you sure?” While I acknowledge that harmony, balance, and incisive inquiry into my perceptions is crucial, it has been my experience that, in the PVL sangha, these concepts are perverted to serve the process of oppression rather than openness. It is with all of these realizations, struggles, and blindnesses that I approached the Conflict-Guide. After reading it in detail and considering the input from various Zen teachers, lay practitioners, comments on this blog, and personal communications with Buddhist practitioners, I stand in agreement that the document is a fair attempt at outlining a process for dealing with interpersonal, low-level conflict. However, and most important to victims of serious conflict, the document fails in defining the ethical principles of the North American Dharma Teachers in the PVL. It fails definitively as a means of holding the teachers accountable because it does not define their scope of practice and what constitutes operating outside that scope. And, it fails catastrophically as compassionate and sensitive model of due process for a victim of sexual, emotional, and physical misconduct by a dharma teacher or member of the Order of Interbeing. However, the document does serve as a straw man whose deconstruction can feed many a crow. 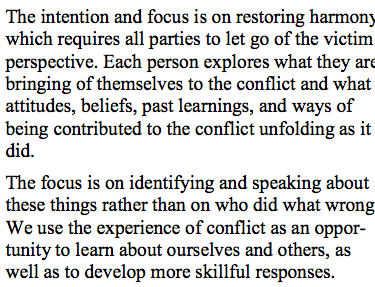 So let me begin with an overall commentary of the Conflict Resolution Guide. Then I will take most of the paragraphs in sequence and set them up against the mirror of what they implicitly demand of someone who has been traumatized. For this, I will be drawing from my professional work as advocate of victims of assault who suffer from complex PTSD, as a police and military psychologist, and my own experience of boundary violation by my therapist, physical assault by a peer member of the PVL Order of Interbeing, and a strong resister of emotional seduction by a PVL Dharma Teacher. I acknowledge at the outset that I am coming from a biased perspective, coloured by my beliefs of what I expect of Dharma Teachers and my own unskillfulness in challenging their inappropriate actions. The purpose of a real Straw Man is to scare away birds and animals that would otherwise deplete a field of its seeds. Its intent is to protect future resources and to ensure the continuation of beings outside its circle of awareness but inside its circle of care. The Conflict Resolution Guide of the Plum Village Lineage (CRG-PVL) does just that. In its unwieldy format, language, and controlled access to the real people behind the scene, it creates a set of obstacles that only the very angry, determined, and/or strong of heart could navigate. In structure, it outlines what the North American Dharma Teachers expect of their sangha members who are in the grasp of a conflict. It offers a background of concepts and intentions to transcend the “adversarial punitive approaches” of “our greater society.” It promises a “moving ahead from the stuck place.” It educates on the historic origins of conflict and suggests that a model of victimology is not useful. 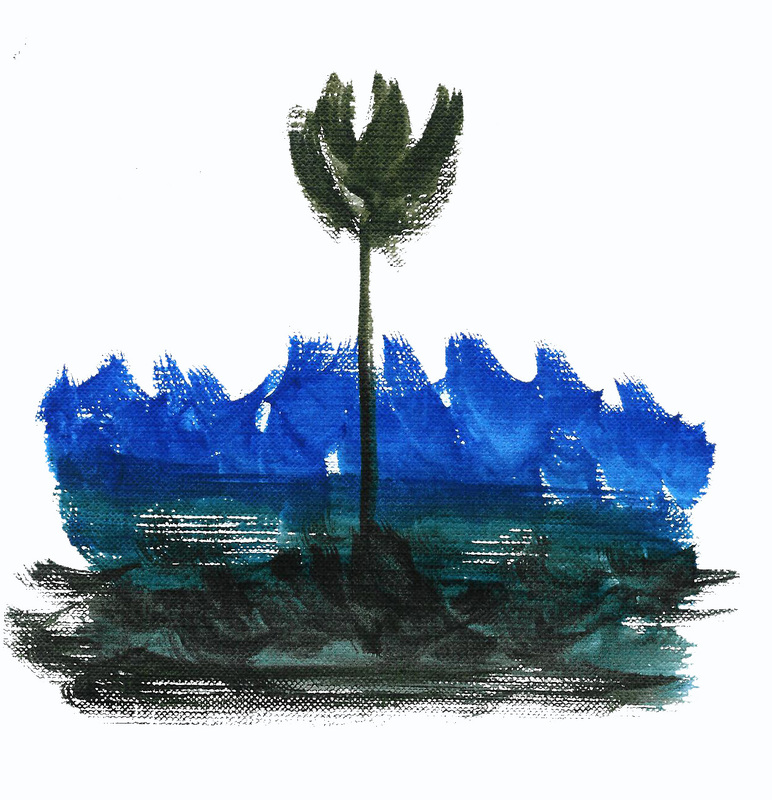 It offers readings and practices that could possibly help to develop insight, understanding, and steadiness in the face of distress. And, up to this point, the Straw Man seems quite friendly and truly interested in the well-being of the person suffering in the conflictual situation. In its description of the process to seek resolution, the Straw man begins its dance and realizes its true intent: to scare away those who would need its resources. There’s a purposeful blindness that centers our perception. I went out into the garden that hugs the south side of the house. It tends to be a haven for butterflies, moths, and assorted flying bugs and beetles. Thankfully, the ravenous Japanese beetles have gone after decimating my lily collection over several years. I go out with my camera into the adolescent growth which sways with a gangly awkwardness as I wade through it. Usually this is enough to send most winged beings flying for safer havens. But that’s only been my perception. Going over several pictures, I was amazed to find little bugs and beetles, ants and bees tucked away in the recesses of petals and leaves. 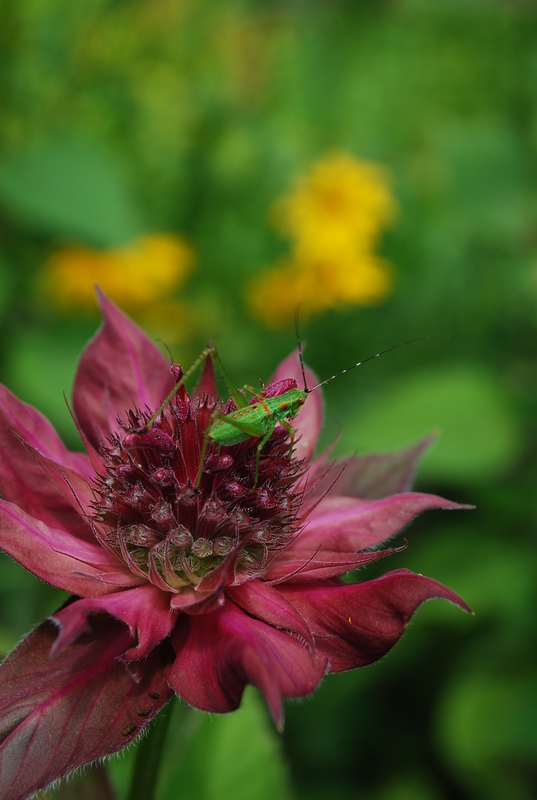 The first few shots of this bee balm caught the blossom and my little green friend didn’t appear to me until I stepped into the shadows and enlarged the shot. He (she?) must have been having a kindness practice day because when I turned back, he was still there, ready to pose in several more angles. He walked daintily across the petals and paused on the crest of the flower. It reminded me of Thich Nhat Hanh’s teachings; to walk on the earth as we would on lotus petals without crushing them. It amazed me that he stayed for so long. Mostly, it amazed me that I had not seen him in the viewfinder the first time. And yet, it might have been a good thing because in the excitement of seeing that luminous green against the mouth-watering red, I might have become obsessed with getting the perfect picture and forgotten to be surprised by his tender relationship with the blossom. Sometimes when we see everything, we miss what is important to truly see. I’ve been immersed in books lately. More so than usual. Unfortunately these are not books I’m reading but books that are arriving, arriving at the door. Books to be reviewed, books to be read, books to be studied. Chaplaincy books, poetry books, psychology books, Buddhist books – all clamouring for attention. And dare I mention the pixelated books in my e-readers that are sending me subliminal messages via 3G? I can skate by with some of these by scanning the text and getting a feel for the author’s message. Others are denser woods to navigate through and I risk not seeing the forest through the trees. In some genres more than others, seeing the trees without losing sight of the forest is important. The specifics of the book are critical to understanding the teachings they impart. They must be practiced to be embodied and only then does a reflection on them have legs. In particular, every book about Buddhism is a book with which one practices. I’ve yet to find a book of this genre that didn’t demand this singular, whole-hearted commitment from the reader. So, I quiver in fear at the number of Buddhist-y books stacking up on my shelf – I cleared out a single shelf solely populated by Buddhism-books-to-be-reviewed – because there are not enough life-times to practice what is contained between the covers of these volumes. Somewhat disheartened, I stumbled around the megalithic bookstore in town wishing every sheet of paper bound between glossy laminates would leap up and flap their way up through the vents in the ceiling. I stared at volumes of books by the Dalai Lama, Thich Nhat Hanh – two of the most prolific authors. I rolled glassy-eyeballs over titles that proclaimed liberation and peace were possible. And I bought one of them. I can justify this! Really. It comes to me unburdened by any publishing company’s publicity agent. In fact, Parallax Press is rather firm in ignoring my offers to review Thich Nhat Hanh’s books despite the sycophantic waving of my brown Order of Interbeing jacket. So, blessed by such ignominy, I feel free to recommend this book, unhampered by any need to please anyone. Awakening of the Heart: Essential Buddhist sutras and commentaries initially looks like a compilation of Thấy’s various sutra commentary books. It’s not. It is 608 pages of revised translations and new commentaries on key sutras. The Anapanasati, Satipatthana, Knowing a better way to live alone (my favourite and a life-changer), Better way to catch a snake, On the Middle Way, On Happiness, Eight Realizations of the Great Beings represent the Pali Canon. The Heart and Diamond sutras bridge us into the Mahayana teachings. Each sutra is given a clearer translation and deeper treatment in commentary than the previous single volumes. This is followed with a series of sections focused solely on practice. 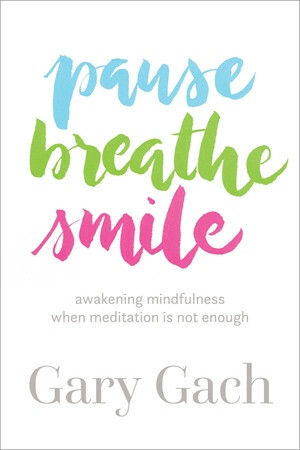 New and detailed exercises for the Awareness of Breathing and the Four Establishments of Mindfulness sutras are available in this voluminous text along with histories of and other texts related to the sutras. The commentaries of the Diamond and Heart sutras are vastly expanded and directly connected to everyday life. There’s a contemplative feel to the writing (though I admit often having trouble getting into Thấy’s style) and it promises to challenge anyone attempting a sutra study. If ever there was a book that qualified being called a Buddhist Bible, this might be it. I’m looking forward to practicing with it over my lifetime. At the end of a retreat conducted in the tradition of Thich Nhat Hanh, retreatants are invited to take the Five Mindfulness Trainings. These are the lay precepts cast in terms of positive engagement by Thich Nhat Hanh. At one level that is so; at another, they continue to contain elements of the “do not” found in all calls for ethical behaviours. While the terminology is not as directive, the commitment to not kill, not steal, not engage in sexual misconduct, not speak in anger or untruthfully, and not to use intoxicants is very much evident. It’s unavoidable really. The first step of any practice whose intention is well being begins with restraint. This aspect of ethics is a touchy one for many of us. We don’t like being told what to do; even more, we dislike being told what not to do. And yet, in the liminal space between moving forward and holding back, there may be something valuable that can emerge. So today, I’m watching the many ways in which I can act with restraint, hold back, pause. Not as a process of denying myself or others but rather as a practice of awareness, of not obstructing the possibility of something different arising.